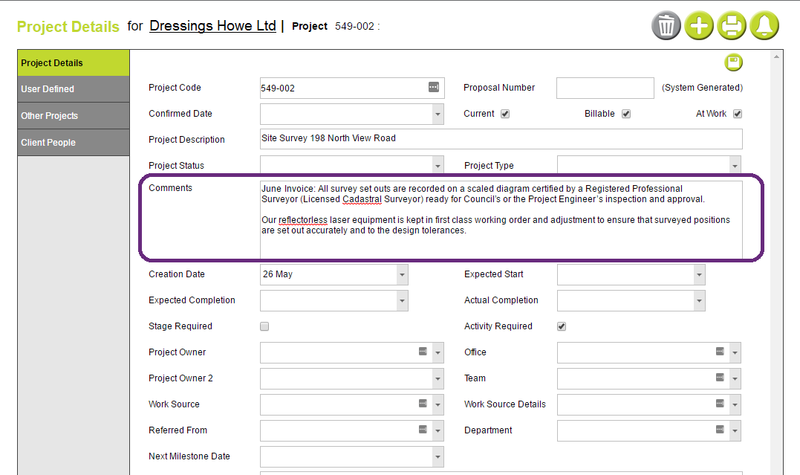 To create an invoice by Fee total with Narration you’ll first need a project with project comments entered. Project Comments can contain up to 3,000 characters. You’ll also need some default invoice narrations to use as the fee and disbursement headings. 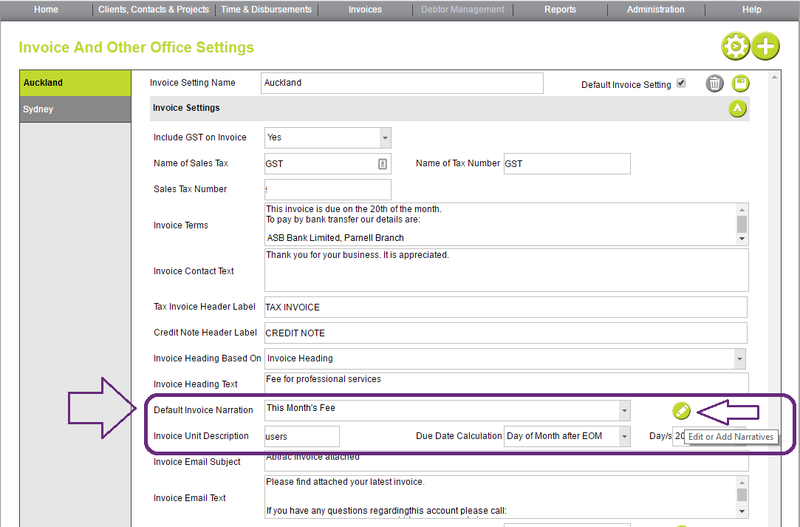 From Administration > Settings > Invoice Settings choose Default Invoice Narration. Choose the pencil icon to Edit or Add Narratives. Enter the default narratives you wish to use as your fee and disbursement headings when auto generating Fee total invoices with narration. At invoicing time choose your client and project and generate the invoice. From the Invoice Lines, Narratives and Amounts section > choose Auto Generate Invoice Lines. 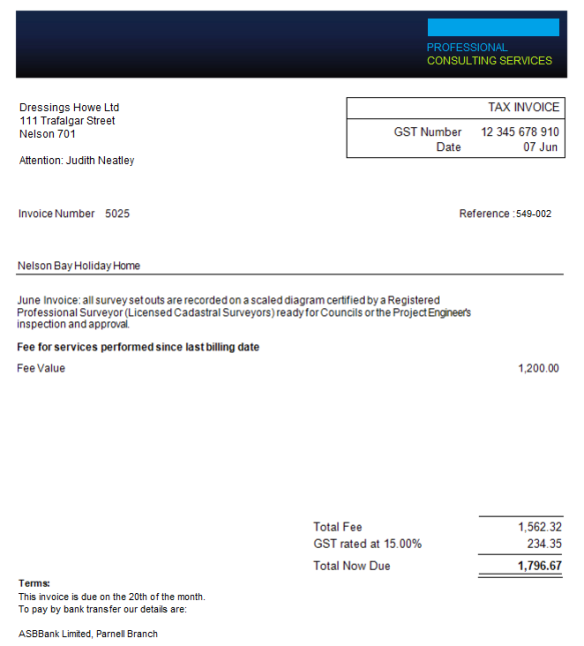 Then choose the Invoice by Fee total with narration option. Choose the option for the narration comments. Presently only Project Comments are available – we are intending on adding more options for auto-populating narration comments in the future. The fee heading and disbursement heading fields can be chosen from the drop downs, and can be added to (and edited from) default invoice narrations. Once you’ve selected your options choose Proceed to auto generate the invoice. The invoice generated will look like one of these two options, depending on your choice for including or excluding disbursement fees. The unbilled time and cost is automatically assigned and line amounts for fee values are automatically created based on this time. Once the invoice is automatically generated you can amend the time or cost assigned from the view assigned time option. You can also use the edit button to amend any of the automatically generated line values or descriptions. 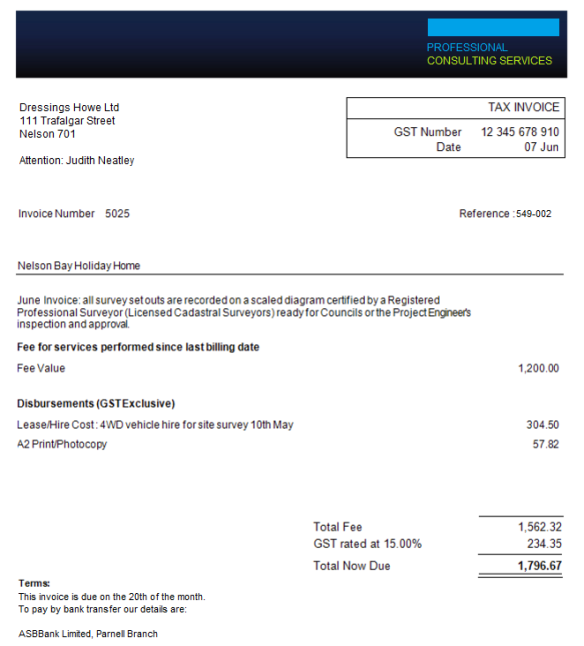 Styling and spacing can also be adjusted in the normal manner after the invoice is created. This entry was posted in Invoicing and tagged Auto Generate Invoices, Default Invoice Narrations, Generate Invoices, Itemise Disbursements, Project Comments by Jen. Bookmark the permalink.